The Law School is pleased to announce the launch of our ILLUMINATE: A podcast series about the law. Illuminate is a short, fun and easy-to-understand podcast series which aims to shine a light on the law. Please go ahead and listen and share amongst your colleagues, friends and family. You will find the podcast playlist and individual tracks on Sound cloud here. 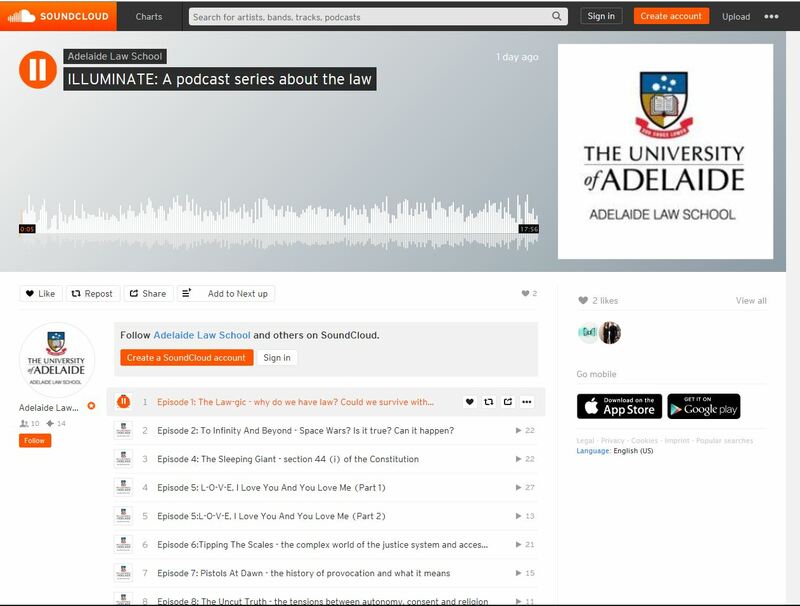 Adelaide Law School would like to thank Lesley Jayasuriya, Gaida Merei and Tina Tran for putting the podcasts together and making it fun and interesting to listen to. Also we would like to thank the following staff for their very valuable contributions and insights Melissa de Zwart, Paul Babie, Dale Stephens, Maeghan Toews, Anna Olijnyk, Alex Reilly, David Plater, Sarah Moulds, Margaret Castles, Kellie Toole, Cornelia Koch, David Brown. Also students Megan Lawson Madeleine Thompson and Judge Geoffrey Muecke. This entry was posted in Events, News and tagged ILLUMINATE, law, podcast. Bookmark the permalink.